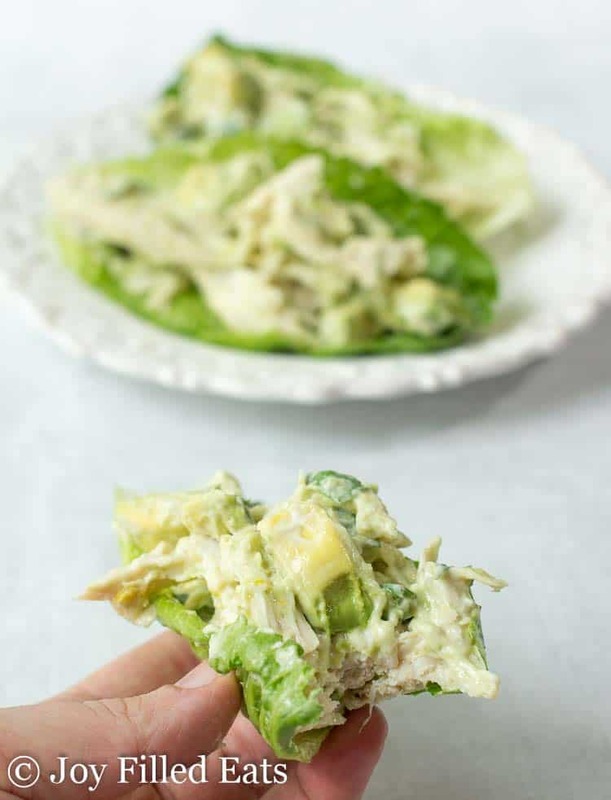 This is the Best Chicken Salad with Avocado I have ever tried. With only 5 ingredients it is the perfect easy lunch on a warm day. 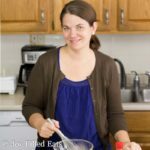 I had the pleasure of attending the Everything Food Conference with my husband and 7-month-old in Layton, Utah a little over a week ago. It was a very blessed few days of meeting blogging friends in person for the first time, learning a lot that goes into the behind-the-scenes business of blogging, and trying some fantastic food. One of the perks was a big packed full of swag from the sponsoring companies. As part of the swag were these cute little basil plants. After managing to keep our basil plants alive traveling back across the county I had to use them in a recipe. One of my favorite easy lunches is chicken salad. Whenever I have leftover chicken in the fridge I make a simple chicken salad for myself to enjoy. I had these Chicken Salad Lettuce Wraps for lunch and they were a welcome improvement to eating the leftovers of my preschooler’s lunch plate… Please tell me I’m not the only mom who does that. I like to keep my chicken salad simple. Chicken, mayo, something green, and seasonings. You don’t need much to make the best chicken salad. 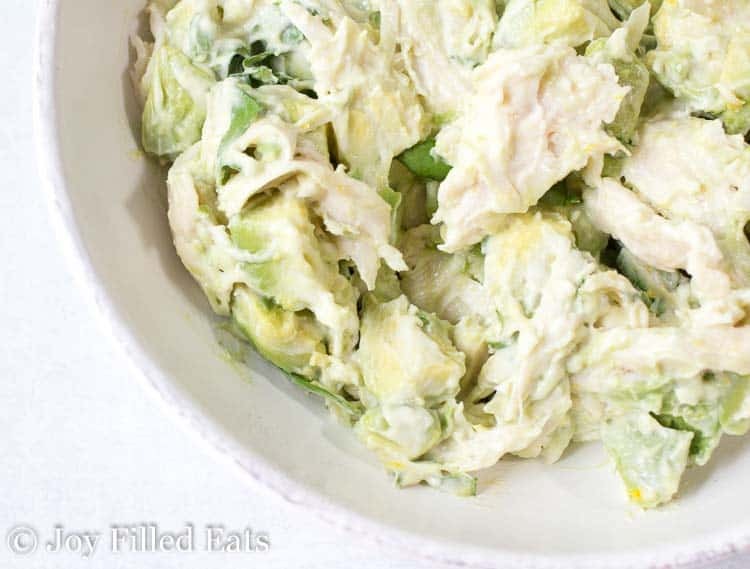 You can make this chicken salad with greek yogurt instead of mayo if you prefer. Sometimes I use a little bit of each. 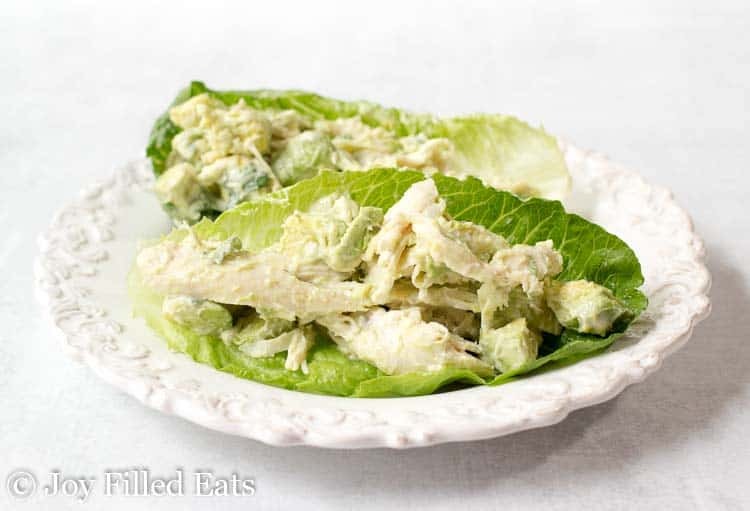 By only using a few quality whole food ingredients this in a naturally low carb chicken salad. 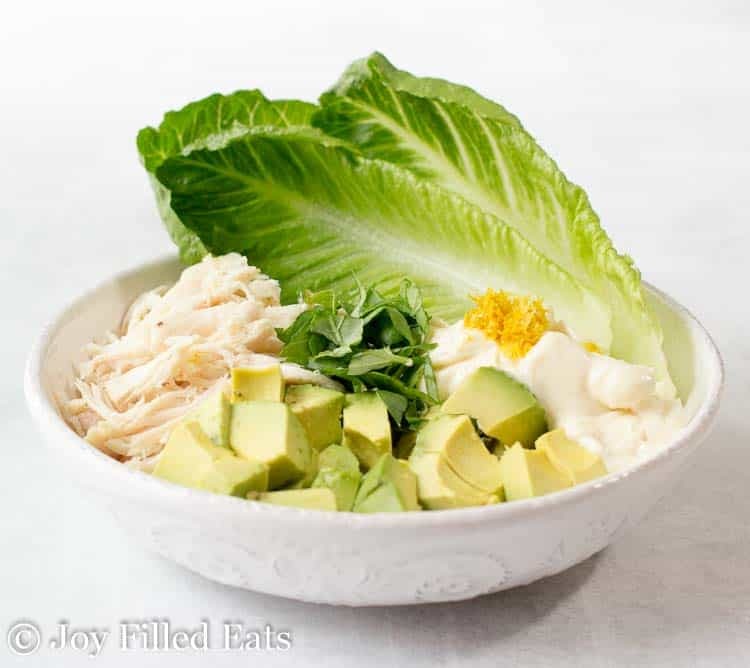 As long as the mayonnaise you are using is acceptable this can be a whole30 chicken salad. It is paleo as well as low carb, keto, and Trim Healthy Mama. This chicken salad with avocado will keep well for up to a day in the fridge. It makes 2 servings so you can make it once and eat it for lunch twice like I did. 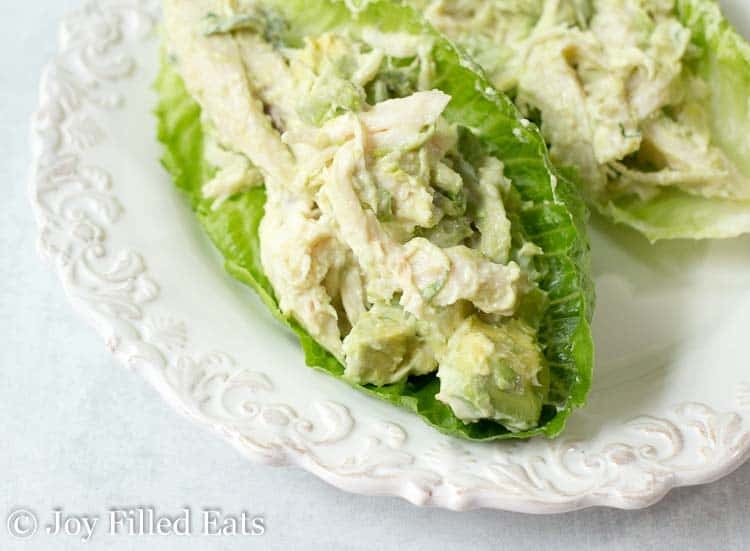 It is delicious in chicken salad lettuce wraps, in a low carb tortilla, or with a spoon. 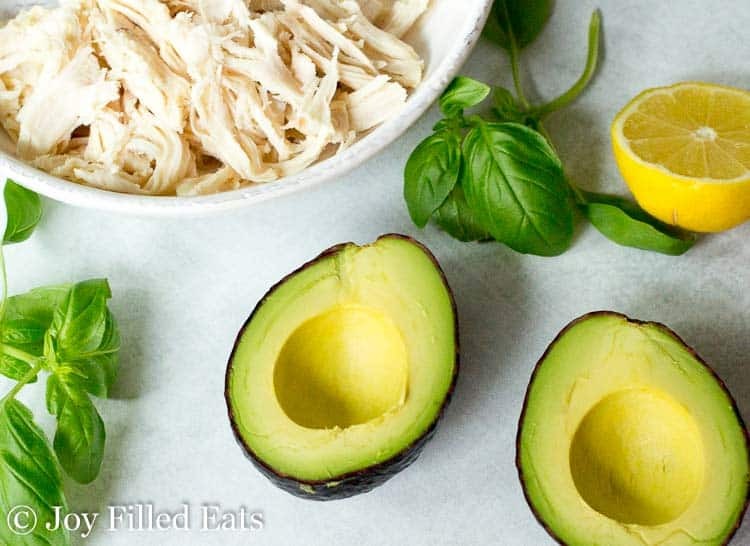 I hope this is the Best Chicken Salad with Avocado you’ve tried too! Gently fold together all the ingredients. Start with 1/4 cup mayo and add more if needed. Season with salt to taste. That's so fun! I'm excited to go to a blogging conference...someday. :) This recipe is great! Thanks for participating in Keen for Keto's keto salad recipe roundup, Taryn! This is a great midweek lunch option that can be knocked up quickly. Particularly liking the basil & avocado in there. Avo always keeps me full for longer. When a recipe calls for cooked, shredded chicken breast, what is the best method? I use leftover rotisserie chicken a lot of the time. Otherwise, I bake chicken breasts in a glass pyrex dish, covered with foil, at 350 until they reach 155 degrees. Then I let them rest to reach 160. This takes about 30 minutes. 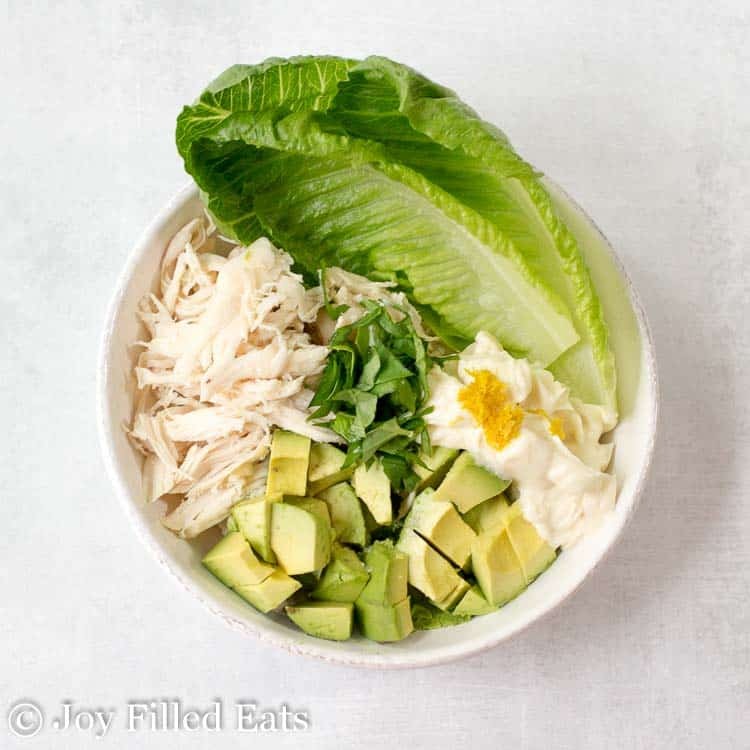 This will be the perfect easy lunch for the summer! Thank you! This is delicious. Very flavorful. Keep the recipes coming. Thank you.